Boats Work for Rhode Island, an initiative of the Rhode Island Marine Trades Association, will present an open house April 30 at marine trades businesses in Bristol and Warren. Rhode Island Marine Trades Day will be held from 9 a.m. to noon in Bristol at the East Bay Industrial Park off Tupelo Street, the Franklin Street Marine Corridor and Poppasquash Road. In Warren, the event will be at the Pearson Marine Group on Market Street. Marine companies will give tours to introduce the industry to local and state officials, neighbors, business partners and associates, and people interested in a marine industry career, including those looking for training opportunities. The event is free and open to the public. Although it is not a job fair, the spotlight will be on career opportunities. The International Yacht Restoration School, located in Newport and Bristol, the MotoRing Technical Training Institute, of East Providence, and the New England Institute of Technology in Warwick will have exhibits. Businesspeople and others interested in the local economy will have the opportunity to learn more about the marine business environment on the East Bay from representatives of the chamber of commerce. The marine trades association will provide information to potential members and assist the public at the event. 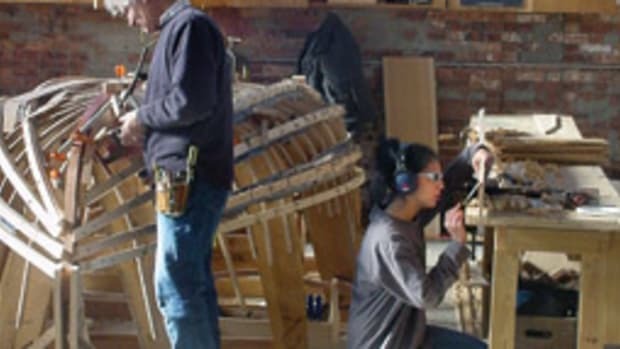 For information about the East Bay Marine Trades Day, call (401) 615-5419 or go to www.boatsworkri.com or www.rimta.org. Click here for the official flier for the event.